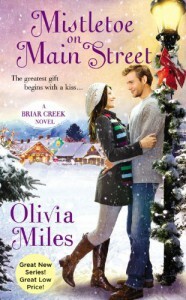 Christmas, small-town romance, and second chances … sound like a recipe for a story I would like. Plus, the cover is so pretty. And who says I can’t start reading a Christmas story in September anyway? Right? Unfortunately, while it is still pretty good, I thought the story moved rather too slowly for me to sympathize with Grace and Luke and their story to return back to love. My issue was mostly on the reasons of they broke up in the first place. I thought there was too much bitterness coming from both: Grace thought that Luke forgot about her too easily after she decided to leave their hometown by marrying another woman. Meanwhile, Luke was overcome with guilt because he never did love his ex-wife (who died two years previously) as much as he loved Grace. They had issues, and for me, it went on for a bit too long for me to be able to believe in their reunion. Both Luke and Grace also lacked that sizzling chemistry which could make me root for them. Also, I wasn’t such a huge fan of Grace when she made that move towards Luke when he was already engaged and then angry at Luke for not taking the step. Although, I wasn’t a big fan of Luke either for being rather undecided with the whole thing. I guess both characters didn’t impress me much. However, I did like the secondary characters in this, i.e. Grace’s siblings: The fiery Anna, who owned a café and seemed to have this vibe of a romance-history-never-told with Luke’s cousin, Mark. And the kind-hearted Jane, who in this book suffered from a failed marriage when she found out that her husband cheated on her. Those two seemed to have a more interesting story, and I would love to follow their journey to happily ever after.